Make sure you have imported or created all the data objects that you want to use for Defining Boundary Conditions. Refer to the Collect Data Objects step. The first step involves selecting the boundary condition type and specifying the location of the boundary condition on the simulation domain. •From the Select Boundary Condition Type combo box, select the desired boundary condition type. 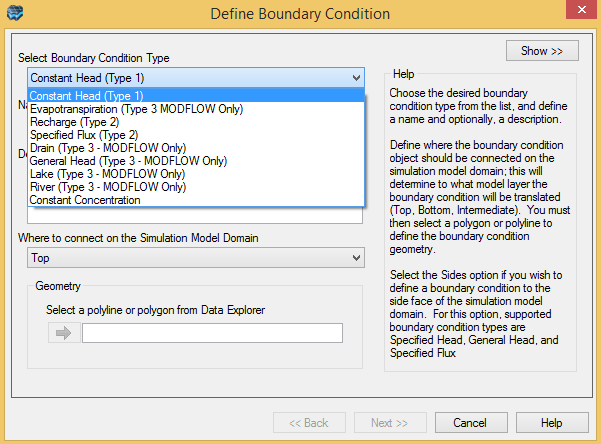 For more information on each boundary condition type including the data requirements for MODFLOW, please see "Boundary Conditions Overview"
•Enter a Name and a Description (optional) for the boundary condition. The specified name will appear in the Model Explorer tree, once the boundary condition is created. Boundary conditions can be applied to the top, bottom, intermediate layers or sides of the simulation model domain, using imported or digitized Polygon or Polyline data objects, or by manually selecting the sides of the simulation domain using an interactive 3D Viewer. •Top: Selecting this option will apply the boundary condition to the top layer of the simulation domain. •Bottom: Selecting this option will apply the boundary condition to the bottom layer of the simulation domain. •Intermediate: Selecting this option will allow you to assign the boundary condition to an intermediate model layer within the simulation domain, by specifying a Connection Elevation value. Upon translation, Visual MODFLOW Flex will assign the boundary condition to the appropriate model layer based on the defined connection elevation value. The next step is to define the geometry of the boundary condition. Boundary conditions that are applied to the top, bottom or intermediate layers can be defined by using a Polygon (areal) or Polyline (linear) data object from the Data Explorer. •Click the button to insert the data object into the Select a polyline or polygon from the Data Explorer field. Please Note: Some boundary conditions only support one type of geometry, either polygon or polyline. Polygons and polyline data objects that extend beyond the model domain must be “clipped” before they can be used to define boundary conditions. Polygons and polylines can be clipped using the “clip to polygon” data operations, which can be accessed in the data object settings (right-click on the polygon or polyline in the Data Explorer, and select Settings... from the pop-up menu). For more information on data object operations, please see "Performing Operations on Data" section. •Click the [Next] button to proceed to the next step. If you select a polygon data object to define the geometry of the boundary condition, the next step is defining boundary condition parameters. Please skip to "Defining Boundary Condition Parameters" section for information on this topic. If you select a polyline data object to define the geometry of the boundary condition, the next step is defining zones for the selected polyline. This procedure is described in the following section. Parameter values must be entered in the units defined in the project settings. To read more about the project settings, please see "Units" section in the project settings. Once the geometry has been defined (see previous sections), the next step is to define the boundary condition parameters. Although each boundary condition type requires a different set of parameters, the data input windows each have similar features and functionality. For information on required parameters for each boundary condition, please see the appropriate heading under "Boundary Conditions Overview" section. •Define for the entire zone (default): This option allows you to assign boundary condition data to the entire zone. •Define Start and End Points: This option allows you to define the attribute value only at the first and last vertex of a zone. •All Vertices: This option allows you to define attribute values for each vertex in a zone (first, last and all intermediate vertices). Boundary condition data can be specified by using the Data Input Grid. Each column in the data input grid represents a required attribute for the selected boundary condition. For more information on the required parameters for each boundary condition, please see the appropriate section under "Boundary Conditions Overview"
Attribute data must be defined for feature (polygon or polyline) in the boundary condition object. Simply select the feature for which attributes are to be defined from the Feature List (the selected line or polygon will be highlighted yellow in the adjacent 2D Viewer preview), and then define the attribute data in the Data Entry Grid. Repeat this process for other features in the selected data object. Please Note: Attribute data must be defined for all features (polylines or polygons) in the selected data object, in order to complete the creation of the boundary condition. •[Apply to All]: use this option (located in the top middle portion of the window) to apply the current parameter values/methods, or mapping for the selected polyline (or polygon) to all other polylines (or polygons) in the selected data object. Useful when you have 10's or 100's of features in one data object, and they all reference a common data source (eg. a surface) or a constant value. For polylines only, it is possible to define attributes at line vertices. 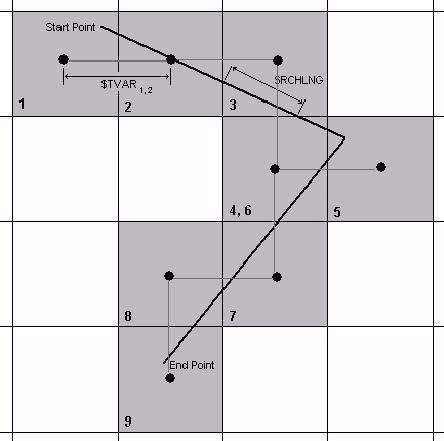 In this case, the Points List will become available, where you can select the vertices that comprise the selected zone. For more information on assigning attributes to points, see "Select the Method for Defining Attributes (Polylines Only)" section. For each attribute in the Data Input Grid, there are two combo boxes. The combo box in the first row allows you to set an attribute as Static (Steady-State) or Transient (conditions change over time). When one or more parameters are set to Transient, the Transient Data button will become active. When selected, the Transient Data window will launch (shown below). The Transient Data dialog allows you to define the stress periods and values for all the attributes in the boundary condition that have been set as “Transient”. •Click the Add Row button to add a new row to the table. •Enter a Start and End time, and a Value for each transient attribute. •Press the [Enter] button on your keyboard. •Repeat for additional stress periods. •Click [OK] to save the transient data. The second combo box provides different methods for assigning attribute values to the boundary condition. The constant value method allows you to define a single value for the entire zone. Upon translation, each grid cell comprising the boundary condition zone will be assigned the specified constant value. When this method is selected (default), simply enter the desired attribute value in the Data Entry Grid. Please Note: The values for each constant value attribute should be entered in the same units as defined in the Project Settings. This method allows you to define boundary condition attributes using an existing Surface data object. Upon translation, attribute values are calculated from the specified surface data object. A surface data object can be useful for defining an elevation attribute, i.e., River Stage, Constant Head, Lakebed Bottom etc. Please Note: The surface data object must cover the entire conceptual model domain area. When this method is selected, click the [From Surface] button to launch the Static Data Control dialog (shown below). •Select the desired surface from the Data Explorer. •Click the button to insert the surface data object into the attribute field. •Repeat for other attributes that have been assigned this method. 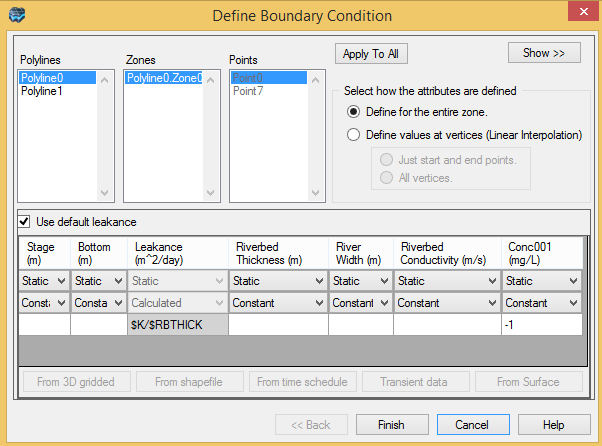 The method allows you to use Shapefile attributes for defining boundary condition attributes (for example River stage, bottom, riverbed thickness, river width and riverbed conductivity or Constant Head starting head and ending head). •The combo box contains all the attributes of the specified polygon used to define the horizontal geometry of the boundary condition. •Select the desired attribute from the combo box, and then click the [OK] button to close the dialog box. This method allows you to use spatially-variable attributes from a 3D Gridded data object for defining a boundary condition attribute. When this method is selected, the Use 3D Gridded Data button will become active. When selected, the 3D Gridded Data dialog will launch. •Click the button to insert it into the Select 3D Gridded Data Object field. •Once selected, the data object’s attributes are listed in the combo box below. Please Note: The specified 3D Gridded data object must horizontally and vertically overlap the defined property zone geometry, or else the data object cannot be used. This method allows you to use a time-schedule data object for defining the stress periods and values of a transient attribute. When this method is selected, click the Use Time Schedule button to launch the Time Schedule dialog. •Click the button to insert it into the Select Time Schedule Object field. •Once selected, the data objects attributes are listed in the combo box below. •Select the desired attribute value from the combo box, and then click the [OK] button to close the dialog box. The Use Default Leakance option is used to calculated the leakance value for River, Drain, Lake and General Head boundary conditions using a mathematical expression containing array variables (see the section “Using Mathematical Formulas and Array Variables in the Visual MODFLOW Flex User’s Manual for more information). If the Use Default Leakance option is selected, the leakance value will be calculated using a default formula associated with each boundary condition type. If this option is not selected, a leakance value will need to be entered manually. The advantage of using the default leakance formula to calculate the leakance value for the group of grid cells is that each grid cell will be assigned a leakance value proportional to the size of the grid cell. •$TVAR1, i is the cumulative length of the line at the ith grid cell along the line, as measured from the center of the Start Point grid cell through the center of each successive grid cell along the line (see following figure). •$LENGTH is the total length of the line, as measured from the center of the Start Point grid cell through to the center of the End Point grid cell (see following figure). When the line is digitized from the Start Point to the End Point, each grid cell is numbered in sequence according to the order in which the line passes through each cell. If the line passes through the same grid cell twice, the grid cell will be numbered twice as seen for grid cell “4” and “6” in the following figure. As a result, the parameter value calculated for “grid cell #6” will over-write the parameter value calculated for “grid cell #4”.